"CP Air" redirects here. For the proposed Carlsbad, California-based airline, see California Pacific Airlines. Canadian Pacific Air Lines was a Canadian airline that operated from 1942 to 1987. It operated under the name CP Air from 1968 to 1986. Headquartered at Vancouver International Airport in Richmond, British Columbia, it served domestic Canadian as well as international routes until it was purchased by Pacific Western Airlines and absorbed into Canadian Airlines which branded itself as Canadian Airlines International. In the early 1940s, the Canadian Pacific Railway Company purchased ten bush airlines in a short time span, finishing with the purchase of Canadian Airways in 1942, to form Canadian Pacific Air Lines. Early management were largely bush flying pioneers, including president Grant McConachie, superintendent Punch Dickins, and Wop May, who would become a repair depot manager in Calgary. In 1968, Canadian Pacific Air Lines was rebranded as CP Air. The Canadian Pacific Railway Company (renamed Canadian Pacific Limited in 1971) had decided to align the airline's name and "Multimark" design to that of its other subsidiaries, including CP Hotels, CP Ships, and CP Transport (CP Rail was spun off from the parent company later). CP Air battled with the government-owned (and government-financed) Trans-Canada Air Lines (TCA, later Air Canada) for international and transcontinental routes for much of its history. Despite early attempts to merge into one national carrier, CP Air continued to operate routes based on its previous bush flying heritage. The federal government established limits on domestic market share and, through international agreements, limits on which countries CP Air could fly to. This barred CP Air from the traditional routes such as London and Paris and limited their access to major Canadian routes such as Vancouver-Toronto and Toronto-New York. CP was forced to develop other overseas routes. The development of the great circle or polar route to the Far East from CP Air's Vancouver base would become one of the cornerstones of the airline. Grant McConachie managed to secure flights to Amsterdam, Australia, Hong Kong, and Shanghai, which helped the airline's revenue grow from $3 million in 1942 to $61 million by 1964. Flights to Sydney via stops in Honolulu, Kanton Island (which was a technical stop) and Fiji as well as to Hong Kong via Tokyo (preceded by a technical stop at Shemya Island in Alaska) started in 1949, with Canadair North Star aircraft (which was a version of the DC-4); Douglas DC-4s then took over in 1951 followed by Douglas DC-6Bs in 1953. Flights to Lima, Peru started in 1953 (extended to Buenos Aires in 1956) and to Amsterdam in 1955. In August 1956 three Douglas DC-6B flights a week departed Vancouver for Amsterdam, with two flights departing for Tokyo and Hong Kong, one flight to Auckland, one flight to Sydney, and one flight to Buenos Aires. Flights 301/302, flying Sydney – Nadi – Honolulu – Vancouver – Edmonton, and non-stop via the Polar route to Amsterdam. Other flights to Europe included Lisbon, Milan, Rome, and Athens. Other routes duplicated parts of the above, but from the 1959 Intercontinental Timetable these appear to be the main routes, and show the inventiveness that Canadian Pacific Airlines needed to employ and how they developed other overseas routes for Canada. The airline was flying DC-4s and DC-6Bs internationally in the 1950s, introducing turboprop Bristol Britannia aircraft in 1958. Douglas DC-8 jetliners began to replace them from 1961, but the Britannias continued on routes that were unsuitable for the new jets well into the 1960s – for example on the route to New Zealand until Whenuapai closed to civil traffic in November 1965. The big Britannia propjet was also used to fly non-stop service from Windsor, Ontario to Mexico City with this flight originating in Toronto before being replaced by a DC-8. Closer to home, non-stop Boeing 737-200 service from Vancouver to San Francisco was being flown by 1970 followed by non-stop Boeing 727-100 service from Vancouver to Los Angeles by the mid 1970s. Also during the mid 1970s, CP Air was operating stretched Douglas DC-8-63 jetliners (which the airline called the Super DC-8 "Spacemaster") on the Vancouver-Honolulu-Nandi-Sydney route twice a week. Service to New Zealand resumed in 1985 along with non-stop flights from Vancouver to Hong Kong, and in 1986 CP Air became the first North American airline with a non-stop flight between North America and Mainland China with a weekly flight to Shanghai. Flights to Beijing, Bangkok, Rio de Janeiro, and São Paulo were added in 1987. Although Canadian Pacific was not allowed scheduled routes to certain European countries, they were permitted to serve countries which Trans Canada Airlines/Air Canada did not choose to serve, so they developed schedules from 1960 onwards to Netherlands (Amsterdam), Italy (Milan and Rome), Greece (Athens), and later several other international destinations. Amsterdam was their principal European destination for these services, with direct flights to both Eastern and Western Canada, and connections were emphasized onwards to other countries. They also developed extensive charter flights (operated mainly in summertime) beginning in the mid-1960s and through the 1970s and 1980s to Britain, France, Germany and other European points which permitted them some access to these markets. Unusually for charter flights, they were listed in detail in their system timetables to show the full reach of the airline. By the late 1970s and early 1980s, many of the routes CP Air had pioneered such as Vancouver–Tokyo were now very lucrative and the previous distribution of routes was considered unfair. In 1979, the federal government eliminated the fixed market share of transcontinental flights for Air Canada (the successor to TCA). While this was a condition that was pressed by CP Air for a long time, it now scrambled to upgrade its fleet to expand on newly available routes such as new nonstop service from Vancouver to Hong Kong and Shanghai to go along with adding more flights to its then current routes like Amsterdam, Rome, Tokyo and Sydney to prepare for increased competition from Air Canada in its traditional territory. This required massive fleet renewal and an associated debt of $1 billion. This debt load, the increased competition, and the economic downturn in Asia would all work against CP Air's future. 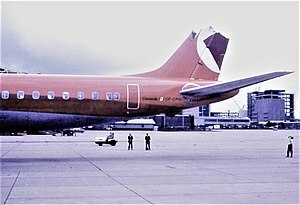 Having been renamed CP Air in 1968 with a new orange livery, the airline in 1986 reverted to its original name, Canadian Pacific Air Lines, with a new navy blue colour scheme and logo. This occurred shortly after the airline had taken over operations of Eastern Provincial Airways. This new incarnation, however, was short-lived. Less than a year later, in 1987, Canadian Pacific Air Lines was sold, along with Quebec's Nordair, to Calgary-based Pacific Western Airlines (PWA) for $300 million. PWA assumed the airline's debt of $600 million. In April 1987, PWA announced that the new name of the merged airline would be Canadian Airlines International. In 2000, Canadian Airlines was taken over by and merged into Air Canada. List is incomplete and uses data primarily from the Boeing Sales Database. There were 15 major incidents aboard Canadian Pacific Air Lines / CP Air aircraft. December 20, 1942: A Lockheed 14-H2 Super Electra crashed on Mount William Knight in the Cheam Range east of Vancouver, killing 13 persons (3 crew and 10 passengers). September 9, 1949: A Douglas DC-3 exploded in mid-flight en route from Quebec City to Baie-Comeau as the result of an onboard bomb, killing all 23 on board. See Albert Guay affair. February 9, 1950: a Canadair C4 overran the runway at Tokyo-Haneda Airport and plunged into Tokyo Bay. All the passengers and crew were rescued. December 22, 1950: (CP004) Douglas DC-3 struck a mountain in the Okanagan of British Columbia while on landing approach. 2 of 18 passengers/crew killed. July 21, 1951: A Douglas DC-4 departed Vancouver, British Columbia for Anchorage, Alaska but disappeared en route without a trace. Eventually, all 37 on board would be declared legally dead. March 3, 1953: De Havilland DH-106 Comet crashed on takeoff from Karachi, Pakistan while on a delivery flight. All eleven passengers/crew were killed. May 11, 1953: a Consolidated PBY-5A Catalina crash landed at Prince Rupert, British Columbia with 2 fatalities. August 29, 1956: (CP307) Douglas DC-6B crashed when it missed the landing due to pilot error near Cold Bay, Alaska. 15 of 22 passengers/crew killed. July 22, 1962: (CP301) Bristol Britannia 314 crashed in Honolulu, Hawaii. 27 of 40 passengers/crew were killed. CF-CPQ after the incident at Sydney Airport in 1971. July 8, 1965: Flight 21 (CP21) Douglas DC-6B crashed near Dog Creek, British Columbia when a bomb blew its tail section away. All 52 passengers/crew were killed. March 4, 1966: Canadian Pacific Air Lines Flight 402 (CP402) McDonnell Douglas DC-8-43 crashed on landing in Tokyo, Japan at Tokyo's Haneda Airport due to poor visibility. 64 of 72 passengers/crew were killed. February 7, 1968: (CP322) Boeing 707-138B leased from Standard Airways (of Seattle) crashed into aircraft and buildings at Vancouver while attempting to land in low visibility after a flight from Honolulu; 60 crew and passengers survived, but one flight attendant died, as did one person on the ground. January 29, 1971: Trans Australia Airlines Boeing 727-100 VH-TJA was operating flight TN592 from Sydney to Perth. Cleared for departure on Runway 16 at Sydney, the underside of VH-TJA hit the top of the fin of CP Air DC-8-63 (CF-CPQ) which had failed to clear the active runway after landing. The top half of the DC-8’s fin was broken off, and the B727-76 landed safely with a gashed lower fuselage. There were no injuries or fatalities. November 1974: a Boeing 737 was hijacked in Saskatoon, Saskatchewan. No fatalities occurred in this incident. June 23, 1985 a piece of luggage that had come from CP Air 3 exploded as it was being transferred to Air India Flight 301; the explosion killed two baggage handlers (Hideo Asano and Hideharu Koda) in Narita and injured four other people. The same kind of bomb was transferred on to Air India Flight 182 killing all passengers. The bomb exploded just south west of Cork, Ireland. Fairchild 82A (CF-AXL) - located at Canadian Aviation and Space Museum in Ottawa. Operated by Airline from 1942 to 1947. Restored by and donated to Museum by Canadian Pacific Air Lines in 1967. Douglas DC-3 (CF-CPY) - located at Yukon Transportation Museum in Whitehorse. Operated by Canadian Pacific Air Lines from 1946 to 1960. Douglas DC-6B (S/N 45329 CF-CZV) - located in Wallmanshal, South Africa, still adorned with Canadian Pacific's original "Empress of Suva" name. Operated by Canadian Pacific Air Lines from 1957 to 1961. ^ "Now boarding..." Retrieved 7 May 2018. ^ "World Airline Directory." Flight International. March 30, 1985. 71. Retrieved on June 17, 2009. "Head Office: One Grant McConachie Way, Vancouver International Airport, Vancouver, B.C. V7B1V1, Canada." ^ "CPA pricelist 1949". Retrieved 7 May 2018. ^ "hong kong | convair | 1962 | 0561 | Flight Archive". Flightglobal.com. Retrieved 2018-05-07. ^ Ba (Nyse). "Boeing: Commercial". Active.boeing.com. Retrieved 2018-05-07. Wikimedia Commons has media related to Canadian Pacific Airlines.